While FP1 suggested that Mercedes had the advantage, FP2 saw the Silver Arrows still leading the way, but Ferrari very much in the mix. Whether it was the unusually chilly temperatures, the overnight rain which had washed Friday's rubber away or Ferrari had simply been holding back, the fact is that FP3 appeared to turn everything on its head. After all, a look at the timesheets shows Sirotkin 10th... get the picture. 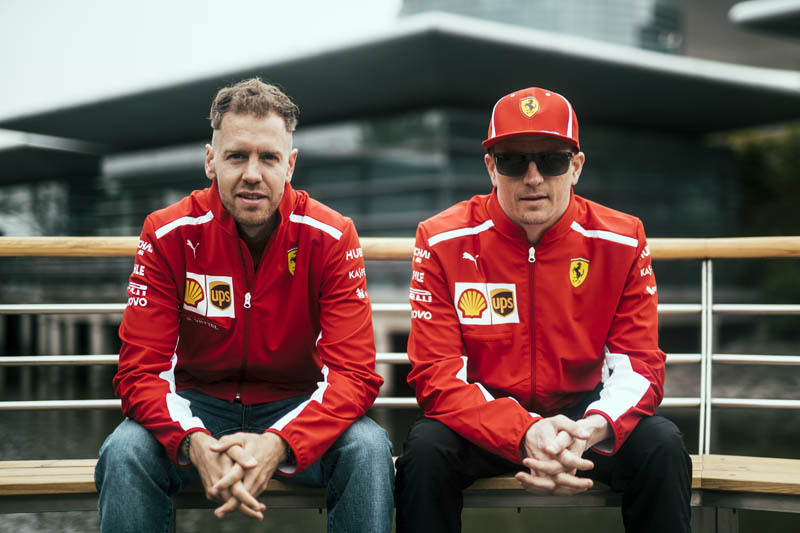 Though the Ferrari usually revels in warmer climes, the Shanghai chill didn't appear to affect the prancing horse as Vettel and Raikkonen out-paced Bottas and Hamilton. Indeed, it was a dreadfully scrappy session for the Briton who, on the back of a number of offs and lock-ups yesterday, had a big, big spin. By the end of the morning the world champion was 1.039s off the pace. Then there was the turbocharger issue that befell Ricciardo, causing the Australian to abandon the car on track as smoke billowed from the back. With teammate Verstappen 0.951s off the pace, the Austrian team is clearly struggling, particularly in terms of grunt. Indeed, it was worth noting that the five fastest times through the speed-trap were posted by Ferrari powered cars, a top speed on 208 mph compared to the Red Bull's 195. Whether we are going to witness another turnaround in qualifying remains to be seen, but at the end of FP3 the only people in the pitlane smiling appeared to be wearing red. Though Grosjean had a brake issue, Haas is looking strong again, while Force India showed signs of a revival in that final session. Renault appeared to have lost a little ground on Friday while McLaren had the edge on Toro Rosso. All in all, FP3 was the perfect appetiser for what could be an interesting qualifying and race, tyre strategy and the weather clearly looking to play a major part. Ahead of Q1, temperatures are little changed from earlier, 12 degrees C air and 16 degrees track. There is a 20% chance of rain. In the moments before the start of the session, there is doubt whether Ricciardo or Grosjean will take part, the Red Bull and Haas crews still working on their cars. To further add to the Australian's frustration, it's understood the new engine provided hadn't been fully built, thereby adding to the team's workload. The lights go green and Sirotkin leads the way followed by Hartley, Gasly, Stroll and Raikkonen. All are on ultras bar the Williams duo who are on softs. Hamilton and Bottas are among the early risers. Leclerc posts 35.189 and Ericsson 35.620, with Hartley and then Gasly (35.016) leapfrogging them both. No messing from Raikkonen who immediately gets serious with a 32.474. Fellow Finn Bottas responds with a 32.921 and Hamilton 33.283. Early days, but Hamilton still 0.8s off the Ferrari pace. Great job by Haas as Grosjean heads down the pitlane. Going quickest in S2, Vettel maintains the pace in S3, crossing the line at 32.171. On softs, Magnussen goes fifth, albeit 1.918s off the pace. As Verstappen heads out, Ricciardo climbs into his own car. On his first flying lap, Grosjean goes sixth, ahead of Sirotkin, Gasly, Stroll and Hartley. Magnussen complains that Bottas got "completely in my way". Perez goes fifth and Ocon sixth, as Force India continues to show signs of revival. Raikkonen reports drops of rain. A 32.932 sees Verstappen go fourth, splitting the Mercedes duo. Out come the yellows as Leclerc slows to a crawl on the pit straight. Replay shows the youngster having spun as he exited the final corner having got one foot on the wet Astroturf a la Hamilton in FP3. The youngster, who has previously admitted to pushing too hard, is able to continue. With 4:20 remaining, Christian Horner looks anxiously to Ricciardo's garage. Hartley, Ericsson, Stroll, Leclerc and Ricciardo comprise the drop zone, with Sirotkin, Vandoorne and Grosjean hovering. With 3:03 remaining, Ricciardo heads out. Brilliant work by his crew. "You'll get one timed lap," he is told as members of his crew congratulate one another. And rightly so. All bar the top eight are back on track, with Grosjean leading the pack of those seeking to improve. Teammate Magnussen is now on ultras. Lots of PBs, as Grosjean goes fifth, Magnussen seventh and Vandoorne 12th. Hartley improves to 15th while Sainz goes seventh, which is bad news for Bahrain hero Gasly and indeed the Williams and Saubers duos. Told he's P20, Ericsson reveals that he locked-up in the final two corners. Quickest is Vettel, ahead of Raikkonen, Bottas, Verstappen, Grosjean, Hamilton, Sainz, Magnussen, Alonso and Perez. We lose Sirotkin, Gasly, Stroll, Leclerc and Ericsson. Bottas is first out for Q2, the Finn on the yellow-banded softs, as is his teammate. The Ferraris are also on the soft compound. The McLarens, on the other hand, are on ultras, as are the Force Indias and Bulls. Bottas goes quickest in S1 and Raikkonen S2, while Hamilton is still clearly struggling. Bottas crosses the line at 32.931 while Hamilton can only manage 33.335 having gone quickest in S3. A 32.286 sees Raikkonen go quickest, with teammate Vettel posting 32.385. Vandoorne goes fifth with 33.505 as Hamilton is told to go for another quick lap. Perez goes fifth (33.484) ahead of Vandoorne and Hartley, but all are demoted when Ricciardo pumps in a 32.688 on his ultras. Verstappen stops the clock at 32.809 to go fourth, thereby demoting Hamilton to fifth. Make that eighth, as Magnussen goes sixth and Hulkenberg seventh. PBs in the first two sectors are followed by another in S3 as Hamilton improves to sixth with a 32.887, albeit 0.601s off Raikkonen's pace. As the drivers heads back to their garages ahead of the final run, Sainz, Vandoorne, Hartley, Grosjean and Alonso comprise the drop zone. A somewhat stressed-sounding Hamilton asks about his sectors. It's not good news. He subsequently heads out again, sticking with the softs. Raikkonen and Vettel are also back on track, now running the ultras. Bottas sticks with the softs. All bar the Bulls are on track as the clock shows 2:00 remaining. "This year, the working ranges of the tyres are sequential," reveals Pirelli. "In other words, the Hypersoft has the lowest working range and the superhard has the highest working range. The cooler the temperatures, the lower working range tyre you need." Raikkonen goes quicker in the first two sectors while Hamilton goes quickest overall, crossing the line at 31.914. Alonso can only manage ninth (33.232) as the Ferrari duo abort their laps which was surely always the intention. Grosjean goes sixth and Hulkenberg fifth as Bottas goes second, Perez also improves as does Sainz, which is bad news for Alonso, Ocon and Vandoorne. Quickest is Hamilton, ahead of Bottas, Raikkonen, Vettel, Hulkenberg, Grosjean, Ricciardo, Verstappen, Perez and Sainz. Strong performance from the Mercedes pair, but one cannot help but feel the old 'party mode' was somewhere in the mix. We lose Magnussen, Ocon, Alonso, Vandoorne and Hartley. Told he's P13, Alonso replies: "OK, looks good I think." "Yes baby, yes!" shouts Grosjean on being told he's P6. Check out our Saturday gallery from Shanghai, here.